This is M.Nirmal Anandh from Madurai. Am very proud to say that, am a blogger from Madurai, Tamilnadu, India. Am giving training for Blogging in Madurai. 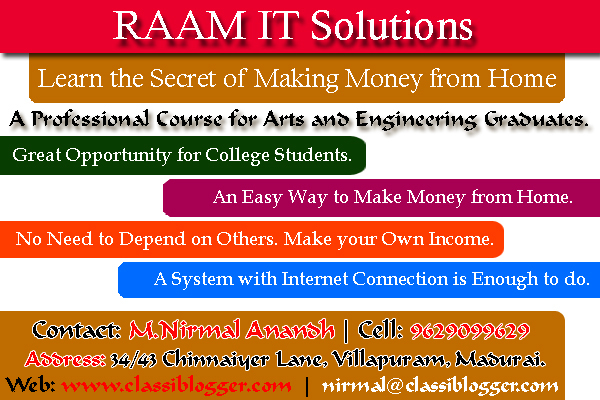 As a profession, I made myself as CEO and Founder of www.classiblogger.com and as well as RAAM IT Solutions. Also am working as Principal in Sri Durgaa Vidhyalayam. Here, classiblogger deals with Make Money Ideas, Blogging Tips and Tricks, Affiliate Marketing, Search Engine Optimization, Social Media Optimization, Search Engine Marketing, Technology, Gadgets, Education, Media, Arts and Entertainment. Then, RAAM IT Solutions deals with Data Entry Processing, Data Entry Outsourcing, E-Publishing, Data Conversion etc… Other than this, to know more about me, better you can Click Here. Surely, I will not say, It’s a Work from Home Jobs in Madurai, you can earn Rs.50,000 within a month by doing this job etc… But you can earn within 6 months, if you follow the tips and tricks by attend the training session given by me. Here i am not going to give you the Data Entry or Online Jobs. I am going to show you the Genuine and Easy Way to Earn Money from Online. The way i am going to show you is “Blogging“. Did you hear the word “Blogging“? The chance is very less and most probably, the answer is “No“. Because the exposure about blogging in India is less, when comes to Tamilnadu, it’s very very less. All are thought that, blogging is difficult and it’s a technical term to learn. You don’t bother about this. I especially created this article for clear your doubt regarding the term blogging. First of all we have to know the difference between a “Blog” and “Website”. Why we create a Blog? The first thing we have to keep in mind is, we should have a strong passion before creating a blog. Because, we all know, without a target, we can’t reach our destination. While compare to a website, a blog is easy to start. There is no need for to creating complex designs to your blog, the default templates are already available in the market for free of cost. You can select any kind of themes and templates that suitable to you. For creating a blog, we can go for free blogging platforms like blogger, wordpress and other free platforms or you can go for self hosted wordpress. If you have a product like ebooks, books, mobile, computer, blog is a prefect and awesome tool to sell your product online. You can also get more number of customers, if you did this by giving free tutorials and videos to your customers. OK. Let’s Come to the Point. What will i teach in this Training Session? How to Earn Money through your Blog? How to place your ads in Blog? How to use Google Webmaster and Other Webmasters? How to use Google Feedburner? How to Create Sitemap to your Blog? How to add Sitemap to Google? How to submit your blog to other Search Engines? How to Create Videos for your Blog? How to get more views for your youtube videos? How to earn money through Affiliate Sites? How to use blogging directories and forums? How to create PDF Files for your blog? There is no age restriction for blogging. A person having little typing skill and browsing skill is enough to do this. Anyone can do this. It will be better, if he/she completed atleast +2. What will you get after completing this Course? Free Traffic to your blog. Free Backlinks to your blog. List of Websites to Earn Money. Free Search Engine Optimization for your blog. I will not teach all the mentioned above tips and tricks for Free of Cost. For this Awesome Training Course, i will charge you Rs.3000/- only. Almost i will cover all the Nook and Corner of Blogging Techniques. If you can’t able to attend this training, better you can buy my product online. It will be surely helpful you to make money from online. How to do Online Job through your Blog? Requirements for Creating a Blog. Requirements for Creating a Website. Important Steps involved in Creating a Blog. How to upload an image to Blog? What are the conditions to follow while uploading images? How to upload Video to Blog? What is meant by Sitemap? How to create Custom Robot? How to create an account in Google Webmaster? How to submit your blog to Google Webmaster? How to add Sitemap to Google Webmaster? How to create an account in Google Analytics? How to create an account in Google Feedburner? How to generate Subscription Form? How to display Subscription Form in a Blog? Purpose of generating Subscription Form. How to add Social Media Plugin to a Blog? How to add Meta Tag to a Blog? How to download free Templates? How to upload templates to the blog? How to create Comment Plugin? How to utilize social media for your business? How to create Hash Tag? How to comment on other blogs? Use of Commenting on other blogs? How to do E-Mail Marketing? How to display Affiliates and Ads to the blog? What is Classifieds and How to use Classifieds? How to create Fan Pages and Groups in Facebook? How to create communities in social media’s? How to reach your audience through Social Media? Note: If you are interested in this course, just come to my office and clear your doubts. Please don’t ask any doubt through phone. Make a call and fix your appointment before coming. RAAM IT Solutions is a growing BPO Service provider in Madurai. They are giving an awesome opportunity for House Wives, Part Time Employees, Data Entry Operators, College Students to work at home without any investment. They are offering easy and reliable jobs like Form Filling, Data Entry, Data Counting, HTML Tagging etc… You can get your payment through direct bank deposit. Don’t miss your valuable time, just Sign Up here and Start Earning Money. Awesome, Well I guess its really great opportunity for beginners to know everything about blogging. I’ll recommend this training to my friends. Glad you like this post and i thank you for recommending this to your friends. Raaja Anandhan this really wonderful and first time i red from your blog you are offering couching classes on blogging professional way, All the best … Yes ! i would strongly recommend in the colleges also should have 1 subject about blogging and what are the benefits about blogging. Exposure about blogging is very less among college students. Thanks for your suggestion. Keep coming. Your article on blog is very good one. I am also trying to do this blog for the purpose of earning through blog and affiliate marketing and Adsense. To further enrich my knowledge and start the niche blog, I would like to attend your training program on this subject. Hi Pugazhenthi, Welcome to my Blog. We can't find the reliable and prompt websites to earn money from online. Most of the websites providing online jobs are scam and fake, because there is no data entry or form filling in online. http://www.mturk.com is the only site providing Data Entry, Form Filling, Image Editing etc… But they stop providing new registrations from indians. As far as my concern, blogging is the genuine and one & only way to make money from online. Anyway thanks for your comment and appreciation. Try to share this post as much as possible to help the persons who are trying and interested to earn money from blogging. Keep Coming and Hope to See You Again. Hey Nirmal! I am also a blogger from Pakistan but I am new in this field and I just love to discover new things in such field and so got great help through your site.